St Louis was a special old colonial town with a great atmosphere. We enjoyed our stay there. Lac Sebta was a very interesting sight and we got to see the locals at work collecting salt. We were not naive enough to expect "Welcome to Senegal" but we did not expect "give me your casserole dishes" before we had even got through the barrier. Formalities were quite quick and included a police fee for "exceptional duty" whatever that is. Our car insurance was going to cost £12 for 10 days or £38 for 4 months and is valid for all CFA countries. We opted for the latter and were pleased with the bargain. We were delighted to find ourselves on proper roads, that is where the tarmac reached the edges of the road. There were even lane markers. Within minutes we found ourselves at the first police checkpoint where Joel was handed a fine for not wearing his seatbelt. He managed to talk himself out of it. The road to St Louis is exceptional and everything you would expect of Africa. This was our first real taste of "black Africa" with scenes of people washing in rivers, women carrying loads on their heads, mango vendors and green, green land. The place even smelt good. St Louis is an old colonial town with a history of the slave trade. It is a tatty place now but you can still capture the old atmosphere by walking into certain bars. The town of St Louis is divided into three areas: the mainland (sol), the island and the spit (La Longue) which adjoins Mauritania at one end and the Atlantic on the other. The three areas are linked by two bridges one of which was built for the Danube but ended up in the wrong town. Senegal kept it - it would! 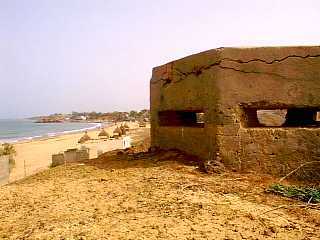 The Senegal River runs from inland towards the Atlantic between the spit and the mainland. In fact the border at Diama is a dam which separates the fresh from the seawater. The campsite (Ocean) along the spit offered splendid views, a bar terrace and a huge beer for 70p. We were in heaven! 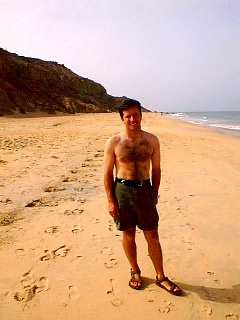 We then went for a swim where I got stung by a jelly fish and accused of breaking a fishermans line. 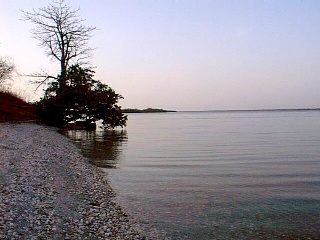 The "Fishermans Village" can be found along the spit too. It is an incredible place full of children and goats. The roads are lined with tables full of fish being dried in the sun. L'odeur poisson is not one that will be forgotten quickly! The next morning we got to use the winch - hurrah! Andrew pulled the back end of Joels car back into shape. With a new light you would never know that it had been involved in a bit of a bump. 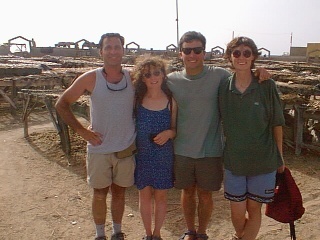 We all took a scenic tour of the town by horse and buggy - until the buggy got a puncture and we had to walk! This is a fascinating town - there is so much history. 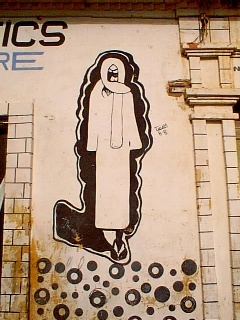 There are drawings everywhere of a man in a scarf representing some sort of spiritual guide. Sadly we had just missed a week long jazz festival. That would have been fantastic fun. The hassle you get from watch/mask/trinket sellers is quite intense. They are really in your face and will follow you into cafes, restaurants, toilets perhaps. They make the Moroccan salesmen look like amateurs. We got to experience the "Harmattan" - the hot winds that blow from the desert bringing with them so much sand that it makes going outside rather difficult. The protection of Punda at 38 degrees was not a pleasant alternative. Fortunately it only lasted half a day before the winds changed direction and we could go to the terrace for a beer. We have heard that the "rains" have arrived early (two months) in the east. We hope it is not true because a number of roads ahead will be impassable. If it is true then we have a very big adventure ahead! The markets are good fun. There is fruit galore to be bought but not that much in the way of vegetables. I had a bit of a run in with a local over a pineapple! Joel was fined £1 for not stopping at a stop-sign. The fine was originally £3 but it could be settled immediately for less!!!!!! We celebrated Punda's 7th birthday on the 21st with a three course dinner for £4.50 each. Fabulous it was too. On the 22nd we said goodbye to Joel and Nadine with the hope of visiting them in France one day. Then there were two! and we pointed the car towards Dakar. 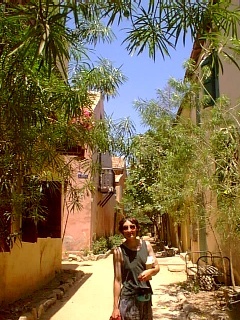 We had been told to avoid Dakar if possible but we had paperwork to do and needed to visit the cybercafe. Within minutes of arriving at the capital we accidentally went up a taxi-only road (there aren't many ordinary cars in Dakar so all roads look like taxi routes) only to be caught by the pincers of the waiting policeman. They know where offences will be made and just sit and wait. Andrew got the fine down from £12 to £4 and had the licence returned. Doug should live here! We escaped from the central area and took a drive around the Dakar peninsular - it is very nice, it's where the UK embassy can be found. There are no campsites in this country. Tourism is not big business but it does cater for people arriving par avion, mainly from France. Campements offering huts are common but you can't fit Punda in these huts, or indeed within the complex. We have to park outside the walls then nip inside to use the bathroom and bar facilities. One night we ended up in the smelliest of fishing villages directly below the airports flight path. We heard that Monday was a national holiday and everything was shut. Our feelings were mixed. We wanted to get out of this town ASAP but we also wanted to experience a fete. The holiday was a religious day - a big celebration of the catholic church. We decided to go to the beach to escape the city with its street vendors but when we reached the beach we were greeted by more Catholics than you could find in Ireland. It seems that our escape venue was to be the centre of Senegalese celebrations. It was good to put the curtains down in the car for a while and escape in the tranquility of the car and adjoining tent for a couple of hours. The hassle factor of this country is very high. For me it is not so bad but for Andrew it is terrible. Islam is strong here and the women largely get ignored. It is Andrew that is on the receiving end of most of the badgering. The site on the beach turned out to be very nice. We got the price down from £10 to £5 to pitch the tent (still expensive) and we were very privileged to be able to share the festivities with thousands of Senegalese Catholics. 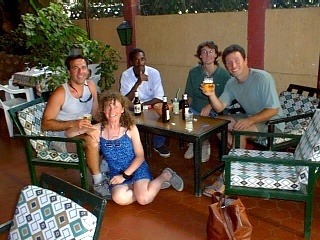 There were about four of us "toubabs" (white westerners) so we got an idea of what it would have been like to be black in a white world. It is an odd feeling but we were fortunate in that the atmosphere was friendly and welcoming (far from what the blacks would have experienced). People were partying everywhere and the music was great. There was singing and the carrying of lanterns to places of prayer. 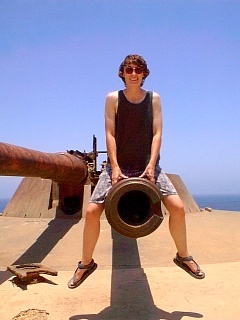 We left them to that bit as we were aware of pushing the limits of intrusion too far. 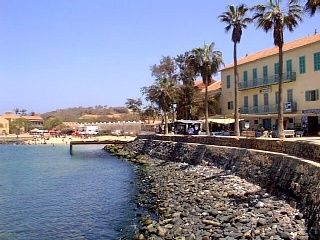 We left the beach to return to Dakar where we visited the Isle de Goree. It is a small island which was used for holding slaves before deportation. Unfortunately we were unable to understand a great deal of the information given in the museum as it was in French! 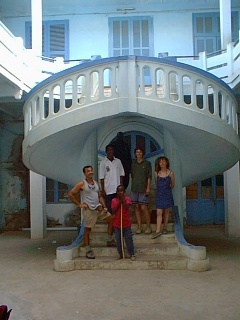 After the visit we returned to the town. The cybercafe failed us again but we did get to eat the most fantastic chawarmas. We managed to avoid traffic offences today but it took three hours to get out of town. We thought London was bad but here is worse. There are no traffic rules (apart from the ones broken by tourists! ), cars don't have lighting of any sort and once out of the main town there is no street lighting. A drive in the dark is not recommended - it is a free for all. We had hoped to reach Lac Sebta (pink lake) for sunset - ha ha. We ended up navigating by GPS and arrived at 10pm. What an interesting place though. Apparently the bacteria in the water produce some iron based substance which is meant to give the water a pinky tinge. We found that if you look at the lake with the sun in a certain position and whilst you are wearing sunglasses you may be able to see a murky brown colour. 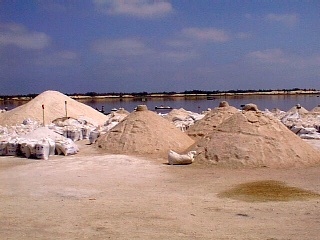 Masses of salt is produced at the lake and a thousand people are employed in scooping up the salt, loading boats and building piles on the shore for drying and bagging. It is an incredible sight. Approximately ten tons of salt is collected every three hours! 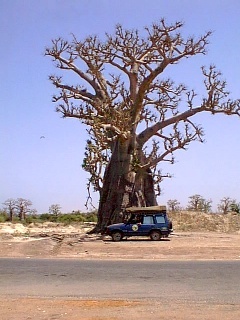 The trip south took us past huge boabab trees and we were soon amongst the greenery of the Sine Saloum Delta. 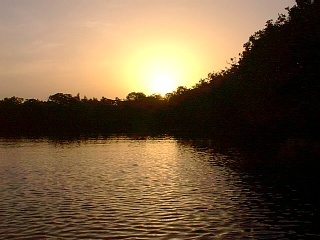 Here the land is divided by numerous waterways and trips around the mangroves are possible by pirogue - a type of canoe. We went on a sunset excursion to "Bird Island". A couple of hours at warp 5 (not) was quite enough and we were relieved not to have taken a full day trip. Bird Island turned out to be an island with a load of birds making a huge racket as they fought for a perching place for the night. The best (only!) good bit was a 16 pelican flypast which was an incredible sight. We camped out in the bush that night - in fact we think we have found THE spot where there are no locals to demand gifts or generally pester. 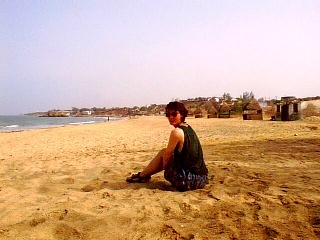 A 5 km piste where you choose rather than avoid the pot hole took us to the Senegal/Gambia border. You never know what to expect at the border checkpoints - demands for gifts, money extraction, sitting and waiting. We are always prepared with a smile and our paperwork in order and hope the officials let us through quickly. We were greeted by the most jovial lot of officials who were practically singing and dancing and praising Allah for Manchester's defeat over Germany. We want more good footy results for when we reach borders! 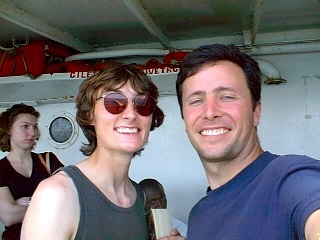 Crossed the border into The Gambia for a few weeks (before returning to Senegal to continue the route south). A bit of history Relaxing by the beach in Popemguine Guess the weight The harbour and town of Ile de Goree When she finds something to take her fancy there's no stopping her climbing on top of it! The national dish is tieboudiene, like Mauritania. It is also common to have yassa chicken or fish (onion & chilli sauce). The chickens are very skinny and if you choose to have some then it's likely there won't be much meat on it. The grilled fish is fantastic because it is coated with a spicy mixture prior to cooking. I ate one fish which was glorious but it had a stern face and very big teeth. The local brew is Flag beer or the inferior Gazelle which is half the price for twice the quantity. Buy a load of international driving licences in the UK. 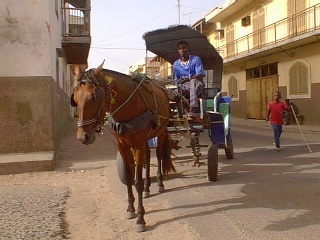 If the fine in Senegal for minor traffic offences is more than £4 then let the police keep the licence. They always say "pick up the licence tomorrow when you pay the fine". I am reading a book about West Africa called "French Lessons In Africa" by Peter Biddlecombe. It talks of his experiences in certain countries and of Senegal he writes "open the drinks cabinet in your hotel room and three traders selling Seiko watches, cassettes of a Band Aid concert or a cheap pair of Indian sandals will jump out on top of you". How right that is. The street traders are very hard work. They work in teams and in close proximity. They are everywhere and follow you around. We call them "stickies". Other than running them over I have no tip to get rid of them. The dam at Diama is reported to be responsible for the outbreak of Bilharzia. The water of the Senegal River is no longer mixed with seawater and has resulted in ecological changes. The dried fish at St Louis is transported to Korea to be used in sauces. It is common for a woman to have 7 children and for a man to have 4 wives! When you buy the car insurance it works out cheaper if you buy it for as long as you expect to be in West Africa because 1 week costs about £20 and 4 months costs about £35. Make sure though you get the CEDAIO or Carte brun. This gives you extra cover for other countries such as Ghana and Guinee (Conakry) which are not mentioned on the normal certificate. It costs little or nothing extra. Though the salesman will tell you the normal certificate is for all the West African countries, the police at the road blocks in Guinee will want to see the Carte brun sometimes.